The head of a copper-alloy small long early Anglo-Saxon brooch. 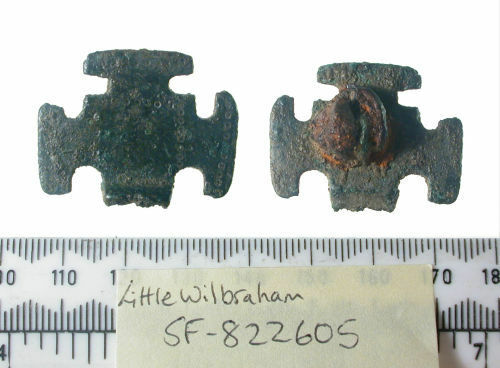 This head-plate is cruciform in shape with a square central panel, it measures 23.9mm in height and 31mm in width. The side and top wings are T-shaped, the front face has stamped annulets along the edges of the wings and forming a boarder around the central panel. A small fragment of the bow survives. On the back face the pin loop survives beneath a mass of corroded iron, presumably the remains of the pin. This small long is very similar to an example from Darlington, County Durham (McGregor and Bolick 1993, 139, no 15.57).